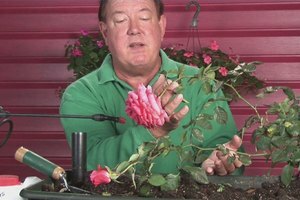 Climbing roses want to get tall, but pieces can be moved around an pinned with twist ties that can be bought at any nursery garden supply store. 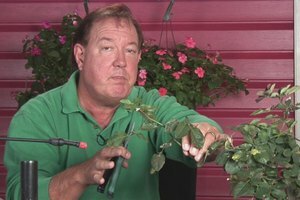 Trim climbing roses when they get taller than six or seven feet tall with help from an urban horticulturist and gardening adviser in this free video on growing roses. 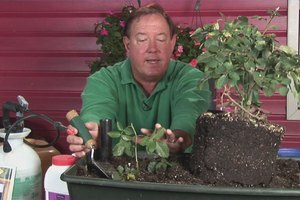 Hi I'm Stan DeFreitas, Mr. Green Thumb. 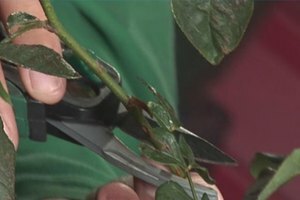 Trimming back climbing roses. Well remember climbers want to get tall, they have long stems and often I'll take some type of a structure and kind of weave them through but occasionally when you are weaving it through that structure you are going to get an area let's say on the rose where you are going to need to trim back this piece and then take that stem and kind of wind it around either a trellis or a pole or something that you have got for some support. 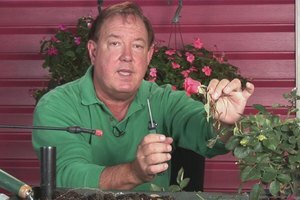 Often I use a little bit of a tie, a little twist tie that you can get at almost any nursery garden supply store. When you have got a rose I have grown well the Don Juan climber for 20 years and when I did that I always made sure I had like a trellis for it to grow up and on. 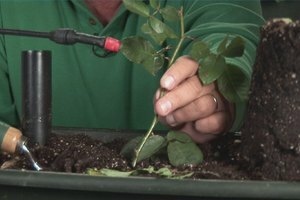 A climber should get maybe five or six or seven feet tall and if you have got a little arbor they can even grow over that arbor as well. 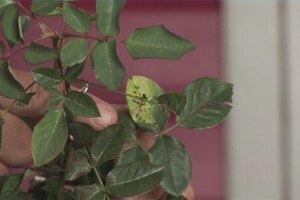 When it does grow out too far and mind often did, it would kind of grow out into the walkway, I'd come back in and I would just trim off the stem that was coming too close so it didn't attack anybody as they were coming in and out the door and that's how you trim them back. For askmrgreenthumb.com, I'm Stan DeFreitas.